Anza-Borrego Desert State Park, located on the eastern side of San Diego County, is the largest state park in California. It has five hundred miles of unpaved roads, 12 wilderness areas, and uncountable miles of hiking trails. It is home to the endangered Peninsular Bighorn Sheep, as well as the roadrunner, golden eagles, kit foxes, mule deer, iguanas, chuckwallas, and the red diamond rattlesnake. This is one of my favorite places to explore, and I currently have three related galleries; my Anza-Borrego Desert Bighorn Sheep Gallery contains photos of a large herd of this endangered species that I was fortunate enough to come across on one of my hikes; my Coyote Mountains Wilderness Gallery is a trail report of a hike to view six million year old sandstone windcaves and marine fossils; and in the Offroad Adventures area of my galleries there is a set of photos from a Project-JK jeep run through Coyote and Sheep Canyons and The Slot and another trip through Coyote Canyon here. 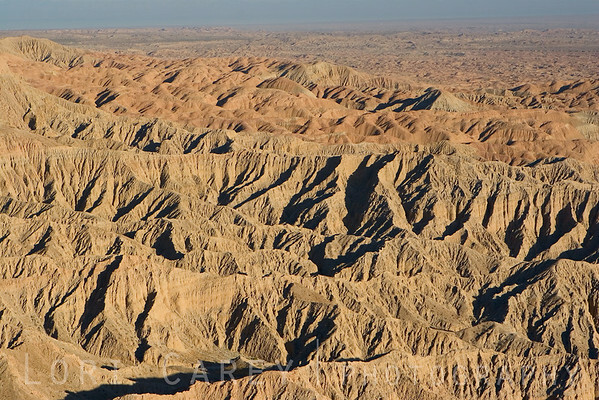 The low angle of the sun late in the day shows the harsh terrain of the Borrego Badlands.